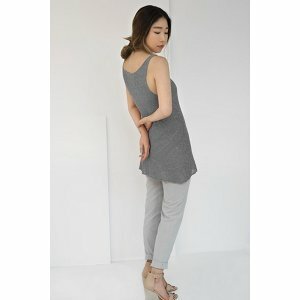 This long, A-line tank top with a simple hem is very versatile and can be knit using a variety of Shibui yarns. To fit bust: 32.5 (34.5, 36.5, 40.5, 44.5)"
Berroco Portfolio Vol. 3 Patterns - Malaga Tank - PDF DOWNLOAD is a similar pattern: 22 (5.5 sts. / inch) finished gauge, adult tanks and vests garment, for women, and dk (21-24 sts/4 in) yarn gauge. You may also like Shibui Knits SS18 Collection Patterns - Mirage - PDF DOWNLOAD, which is another similar pattern: 22 (5.5 sts. / inch) finished gauge, adult tanks and vests garment, and for women. You may enjoy taking a look at the , and Shibui Knits Twig Slope Top kits all using Shibui Knits SS15 Collection Patterns. Hopefully our suggested yarn options for Slope - PDF DOWNLOAD can help you come up with your next exciting new project idea!